This weekend I was extremely inspired by Gala Darling's post about her Filofax. In fact, I was so energized by it that I completely revamped my tabs system in my personal Deco Filofax, which was no small feat. I've been using more or less the same tabs setup for years in my Filofaxes, with some slight variations. But Saturday I had some time to really think about my tabs and what would work better for me. First of all, let me say I really enjoy Gala's upbeat love-yourself vibe on her blog. I read through several of her posts* and they really got me thinking about my life and what I want to focus on. One goal of mine these days is to have more fun in life in general. I wanted my Filofax to reflect that too, and to work FOR me instead of being a burden full of things I OUGHT to do. 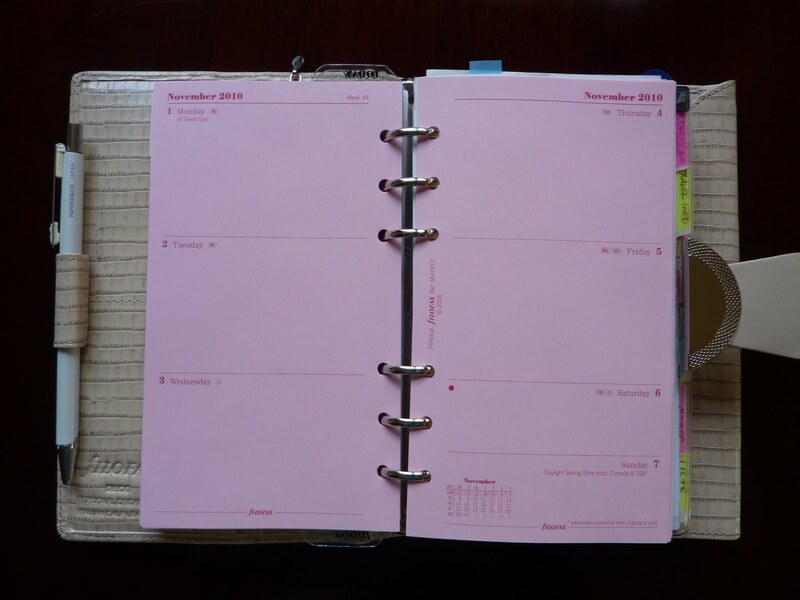 The first thing I did to add more fun to my Filofax was to put in the pink week on 2 pages diary insert (as I posted about on Philofaxy). I think it looks great, and it reminds me every day not to take things too seriously! The next thing I did in my Filofax was add a Me tab, which is something I've never had before. You would think the entire contents of my Filofax would be about me, but surprisingly little was about my needs and wants. It contained my diary pages, contact info, travel numbers and maps, children's info, emergency numbers...none of it was much fun and certainly not very inspiring. My new Me tabbed section contains all the things about me that I want to nurture. In it I have my New Year's Resolutions to remind me of my intentions this year. I've started a new list of inspiration, things to contemplate and remember. Also in this section I keep my exercise routine because I want to see it as something that helps me be healthy and happy and not another chore to tick off. This section is all about being uplifting, energizing, and positive. After I added my Me tab somewhere in there among all my other tabbed sections, I took a good look at how my setup was working for me. The answer was, not very well. Then behind that were Notes and Financial. I realized it was silly to turn half the pages in my Filofax to get to my Lists section every time I needed to see my weekly lists. Also, I had my least-used sections up front and my most-used sections buried in the middle. Notes (containing blank pages for quick jotting) and Financial (with my calculator and Budget sheets) are behind those. I like this setup a lot. I use my Lists the most, and my Me section is right up front where I will look through it often. *Gala's article How to Set Amazing Goals really resonated with me, especially "Have a Goal that Scares You." This move to Scotland has been a goal for a long time, and it seemed like a far-off wish. Now that it is actually happening, it's very exciting and thrilling yet also there's a lot about it that scares the crap out of me. It's the chance of a lifetime to live our dream (mine, my husband's and our kids' too, they adore Scotland) and we are grabbing it with both hands. I've done a lot of big moves in my life and made super-major changes, and yes it's hard but it's also incredibly rewarding and life-expanding. Today is the first day in the 2010/2011 Moleskine 18 month planners! For those of you using one of these planners this year, it's time to bust it out and rev it up. If you haven't read Gala Darling's amazing post about her new Raspberry personal Metropol (complete with written usage details and lots of photos!) then you don't want to miss it. 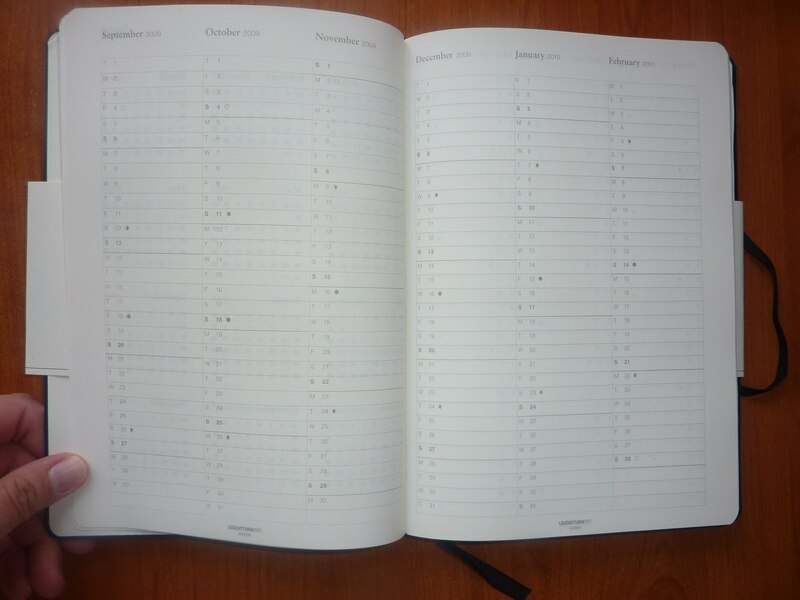 Go have a look, but get ready to go Filofax-crazy. This post was just about enough to convert me back to my personal size Filofaxes!! This was very generously sent to me as a sample by Leuchtturm 1917. It's an excellent planner and I'm very glad to have the opportunity to review it! Thank you Leuchtturm! This planner has a really nice layout on the daily pages. 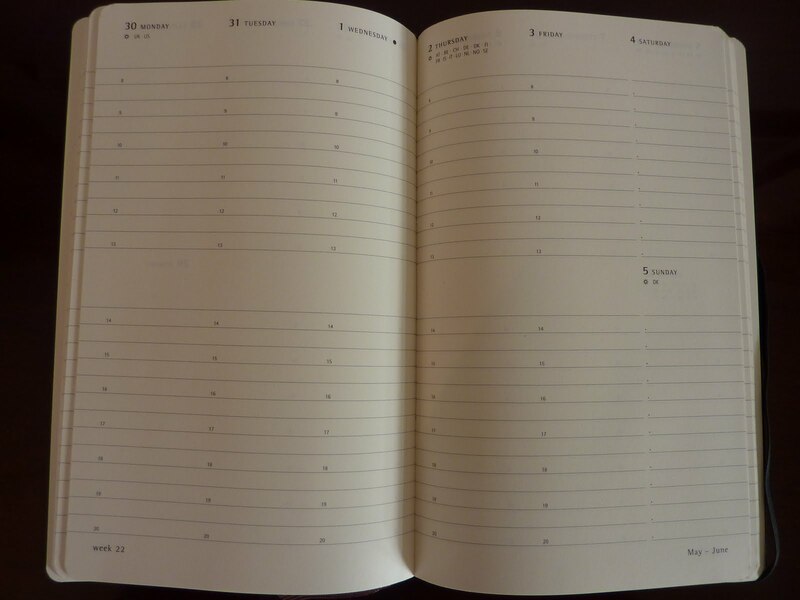 Each day has timed lines for appointments, and at the bottom of the page there is a blank space for notes. Country codes for those countries having a holiday that day are listed at the bottom of each day's space. Saturday and Sunday share one page, with each day as a vertical column (click on photo for a larger view). This planner has a black hard cover, ribbon placemarker, acid-free paper, elastic strap and pocket in the back of the book. In the back of the planner there are several blank pages that are perforated for easy removal. Additionally, there are stickers included to label the cover and spine of your book. 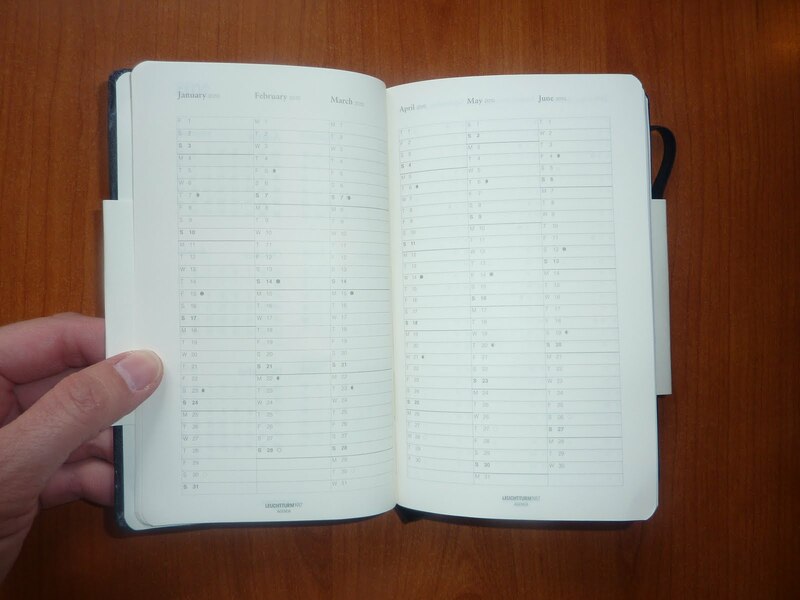 This book measures approximately 3 3/4 by almost 6 inches, which is a very portable size that you can take with you anywhere.The Leuchhturm daily planners also come in Medium and the enormous Master size. 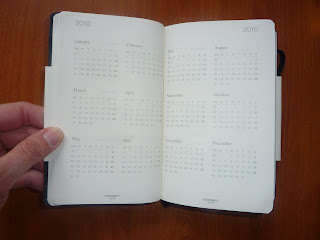 At this time I'm not sure where the 2011 Leuchtturm planners will be available to purchase. 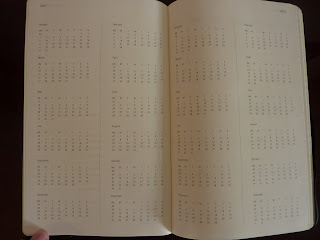 You may want to contact Journaling Arts to ask if they will carry the daily planners for 2011. I know JA have carried the Master size weekly planners in the past, at great prices, but I don't know if they have plans for the daily ones. Alternatively you can contact Leuchtturm and I'm sure they would be happy to direct you to the nearest retailer to find these planners. Many thanks again to Leuchtturm 1917 for allowing me to test their products. 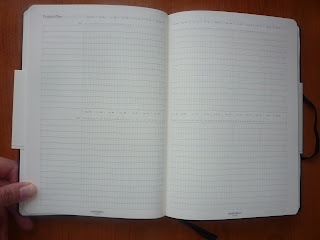 Stay tuned, in a future post I will review their huge Master size weekly planners! Recently the At-A-Glance blog had this excellent post on different ways to use a day-per-page diary. I thought it was a great article, and couldn't help adding my 2 cents by including my list of various uses for a day-per-page diary that I had in a post awhile back. This got me thinking about using a day per page diary myself. This is a road I've been down many times. 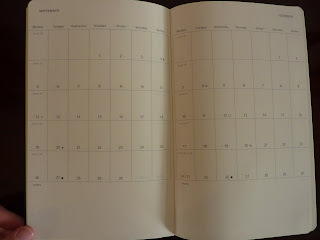 I have learned that I can't plan ahead very well using a day per page diary, but they are fantastic for recording. So I went browsing the new 2011 daily diaries. I'm currently in love with Letts products because I am writing my review of some new notebooks of theirs, which I'm very impressed with and immediately addicted to. So I instantly thought of Letts for my diary search. This is the Sovereign day per page diary. It has a textured cover and creamy paper. It's A6 size, which is an excellent size to use as a daily diary/ planner because you can carry it around everywhere (and thus capture all your jottings) yet it still has a large enough page size for everything you need to record each day. 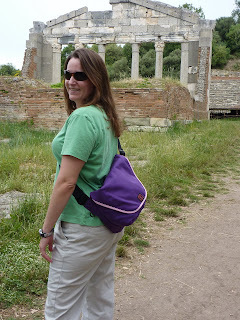 It comes in this gorgeous purple color, black or red. So now I have a few months to obsess over this before it becomes available. Luckily for me, by the time this comes out I'll be living in the UK so I won't have to pay international shipping for it (and if I'm really lucky I'll find it locally in a shop and won't have to pay postage at all!). 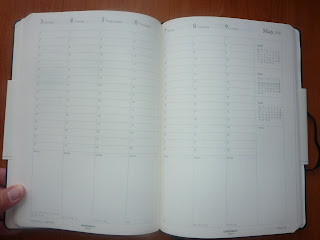 Those of you who use a day-per-page diary as a planner or for record-keeping, what's your favorite diary? I always like to celebrate the summer solstice by grilling out with friends. It's a good excuse to hang out and grill up some grub. And, a day late but Happy Father's Day to all you dads out there! Hope you had a great day yesterday. 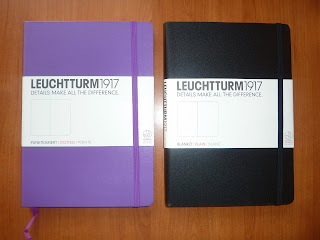 Here are two notebooks from Leuchtturm 1917, a German company who very generously sent me several of their products to review. I've already reviewed their medium size weekly planners. 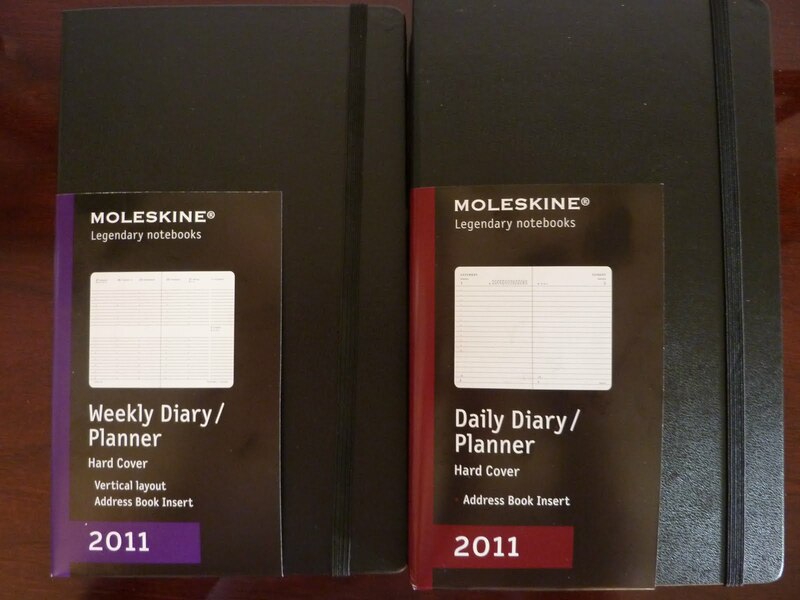 In future posts I will review their Master size weekly planners in two different formats and their Pocket size daily planner. But first, these awesome notebooks! The black-covered notebook has blank pages, and was sent to me as a sample from Leuchtturm 1917. 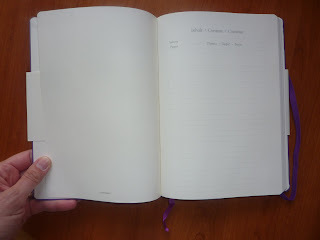 The purple-covered one, which I adore, has dotted pages and was VERY generously sent to me from Lady Dandelion after I won it on a giveaway contest on her blog! Thanks Lady Dandelion! I love it!! Before I dive right into the cool features of these notebooks (and there are some very cool features so hang on a sec), let me tell you about Leuchtturm 1917 (and you can also read more about the company here). Founded in (you guessed it) 1917, Leuchtturm (which means "lighthouse" in German) makes high-quality, archival stationery products including diaries, notebooks, binders, photo albums, boxes and more. Their products are very popular with collectors of stamps and coins because they know their collections will be safely preserved. Now, on to these notebooks. I am very impressed. Go get a cup of your favorite beverage and settle in. I'll wait. At first glance these look similar to many notebooks available today with the hard cover, elastic strap and back pocket. 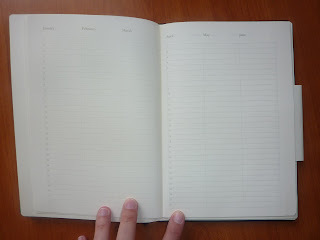 But right away you start to notice differences that indicate a step or two up in quality from the usual notebook. As the brand motto says, "details make all the difference." The notebooks have a color-matched ribbon placemarker which is actually ribbon, not cotton, adding to the luxurious feel of the book. The creamy paper is smooth, and again gives a feeling of luxury. And, every page is faintly numbered! HOORAY!!! 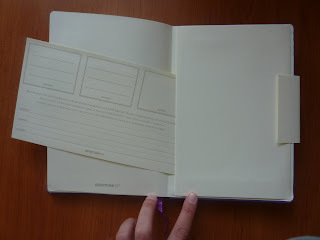 This makes it very easy to index your pages and keep track of what you wrote and where in your notebook. This makes Leuchtturm notebooks especially useful not only for art and writing but also as lab notebooks and to record research. I wish I'd had some of these in grad school! Each of these notebooks has a page of stickers you can use to label the cover and spine of your notebooks. Additionally, the blank notebook has a page-size card that is lined on one side and quadruled on the reverse, so you can be tidy about your writing and drawing while still having unruled pages. The dots have 5 mm spacing and are great for writing, drawing, creating charts and tables. 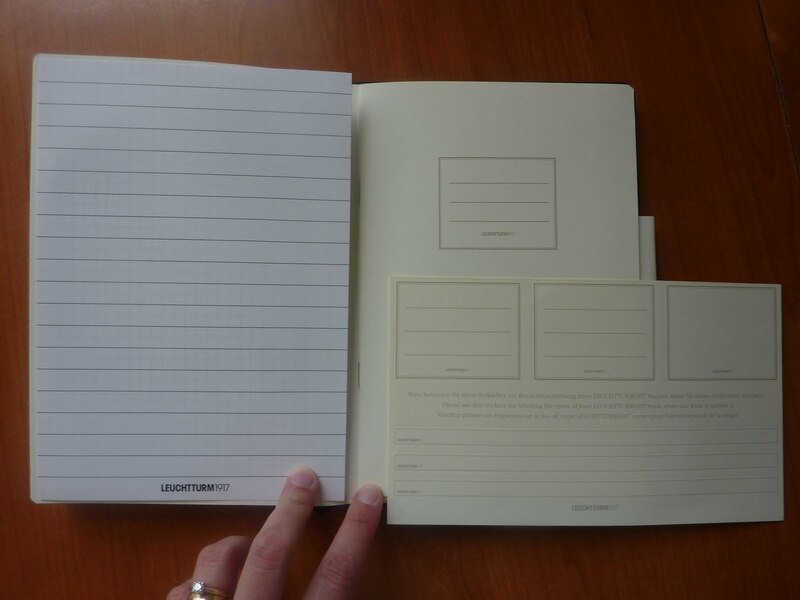 This is a great alternative to quadruled pages. 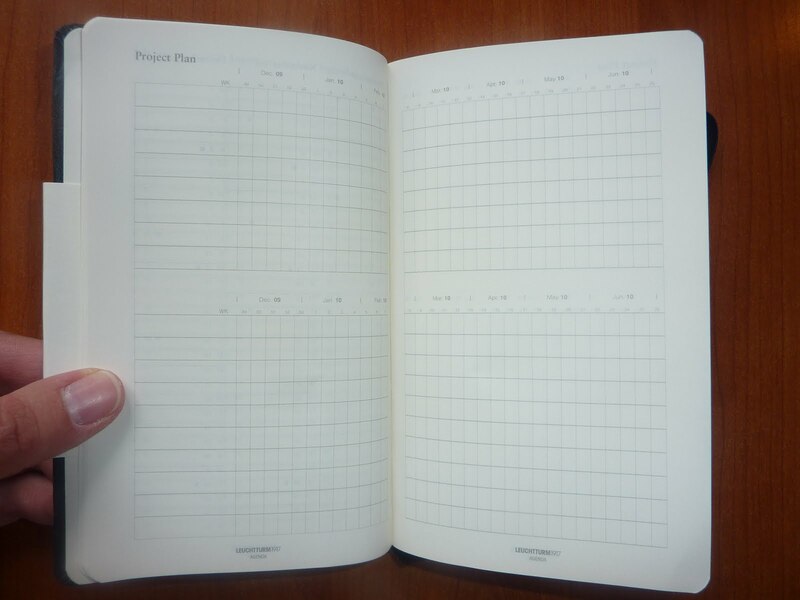 The last several pages of each notebook are perforated for easy removal. The paper is acid-free and archival, and the book is thread-bound for durability. These notebooks are the Medium size, measuring 145 mm wide by 210 mm tall (almost 6 inches wide by just over 8 inches tall). Pocket, and Reporter (both sized to fit into your pocket), in lined, plain, quadruled or the new dotted pages. You can order the newest Leuchtturm catalog by mail or by email by filling out their online form. 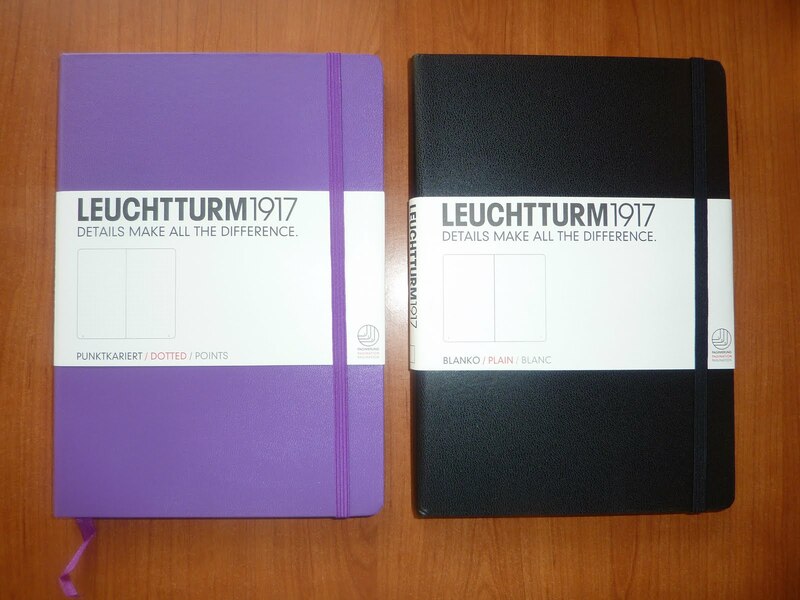 Leuchtturm notebooks can be purchased online at Journaling Arts (for fantastic prices). Thanks again to Leuchtturm and Lady Dandelion for these excellent notebooks! 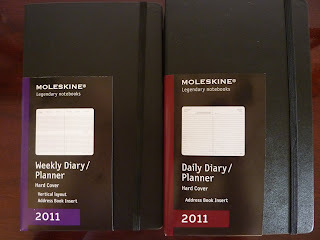 Though it's only June, I am already excited about my new 2011 Moleskine planners! I pre-ordered (from Amazon) the large hard-cover Daily, which will be the fourth (!!) year running I've used this as my journal, and the Vertical Weekly. As you can see in the above photo, the packaging for the planners is new this year. The different formats each have a different color on the label, which makes it much easier to make sure you're getting the format you intend to. I love the simplicity. I love using this as a journal. The lines are the perfect ruling size for my handwriting, and I like the icons at the bottom of each page to record the day's weather (click on the photo for a larger view). The layout of the page is great. I appreciate the space at the top of the page to write the day's major event. I really like the month calendars this way! Seeing two months at a time really helps me plan ahead. 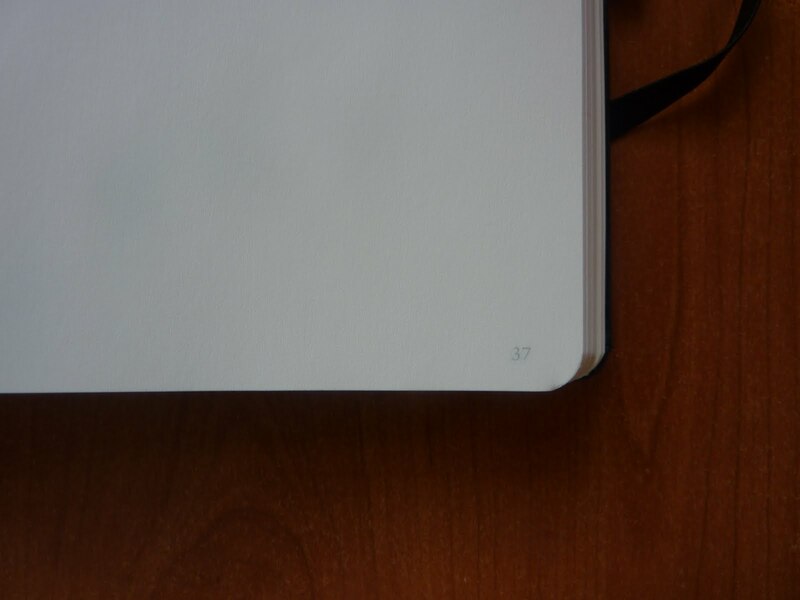 And I like the space at the bottom of the pages for that month's goals, reminders, or notes. 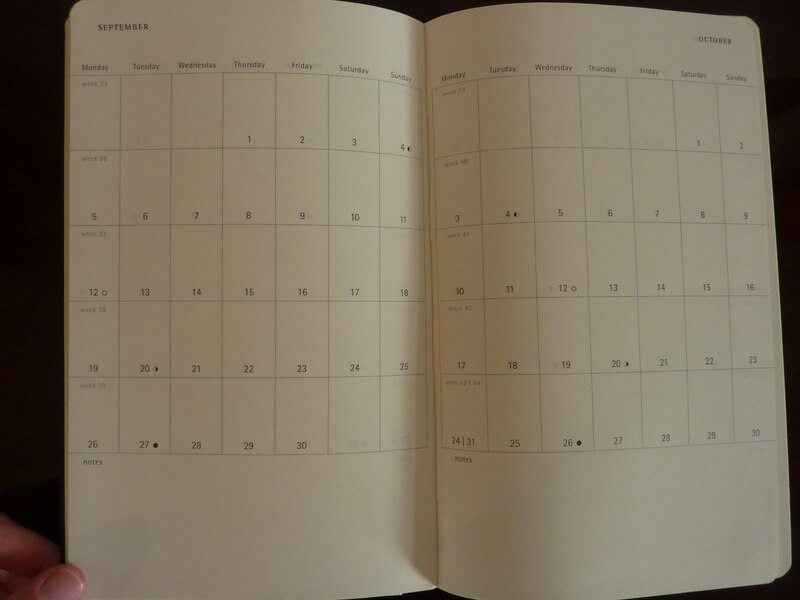 In my opinion, losing the future year's planning pages is a small price to pay to have this excellent monthly layout. This is a format I've used before in other brands but not in a Moleskine. I like that there are no lines drawn to delineate the daily columns. I don't particularly like the big gap between 13:00 and 14:00 on the weekdays. But, what I intend to use this planner for is a modified week + notes format where I use the top portion of the day columns as my days, and the space under that gap for the week's lists and notes. Not having vertical lines drawn for the columns will make it easy to write across that space as I need to. Unfortunately I have to wait until January before I know if this method will work for me or not!!! I've used the Moleskine 18 month weekly notebook, but this is my first Moleskine 12 month weekly planner. It is so amazingly slim. It's slimmer than a Moleskine ruled notebook. It's a very streamlined book. In both of these planners the same usual Moleskine features apply: international holidays and dialing information, time zones map, travel planning pages, pocket in the back etc. 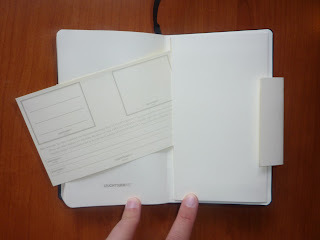 Let me just say: I know some people are picky about the Moleskine paper, but I love it. Is anyone else chomping at the bit for next year's planners already?? Or is it just me? For those of you looking for a weekly planner with all seven days as full-size vertical columns, here it is!! 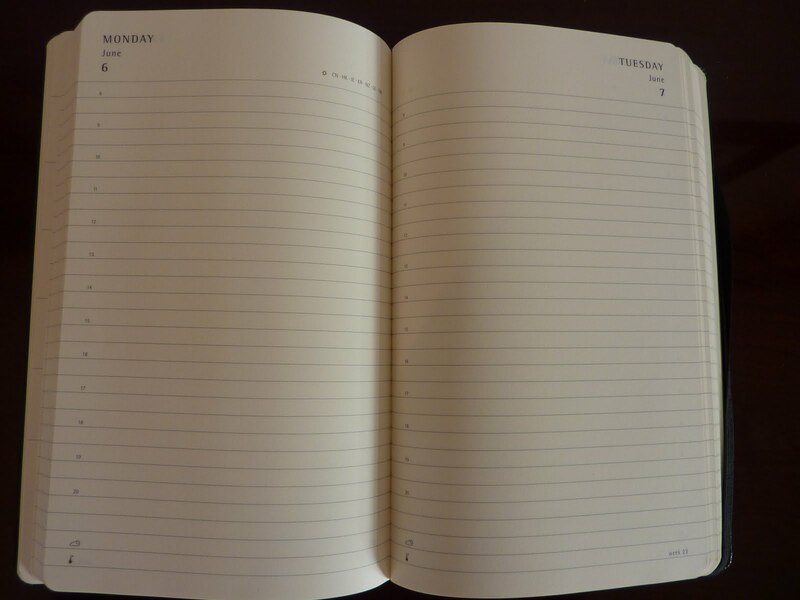 Leuchtturm 1917 does this hard-to-find format beautifully. Every day, even Sunday, has a full size column with a space for notes at the bottom of each day. 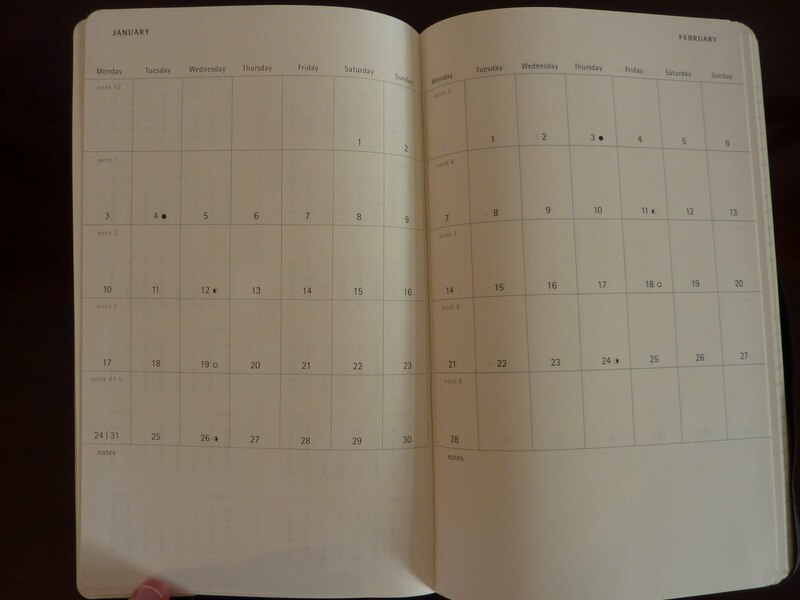 The 8th column has monthly calendars and extra space for notes. I've seen planners before that have all 7 days as full-size columns, but they've been desk size, in the range of 8 1/2 by 10 inches or larger. The thing about a 7-days planner is that it needs to be small enough to carry with you everywhere: work, home, weekend plans, school events etc. 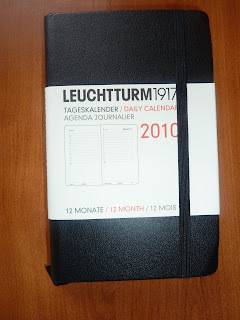 Leuchtturm 1917 very generously sent me their medium size 18 month weekly planner for 2010 (which goes from 1 September 2009 through 28 February 2011) and 12 month weekly planner for 2011. 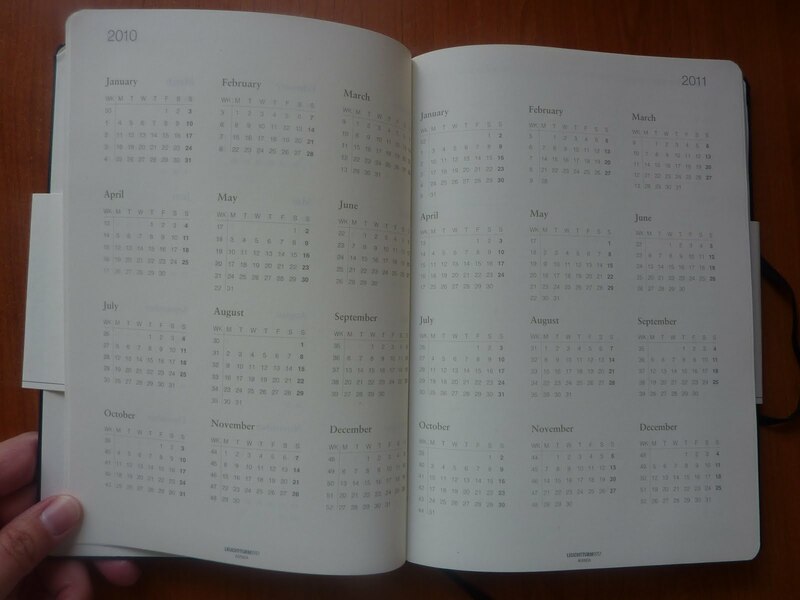 Except for the dates, the features of these planners are identical. 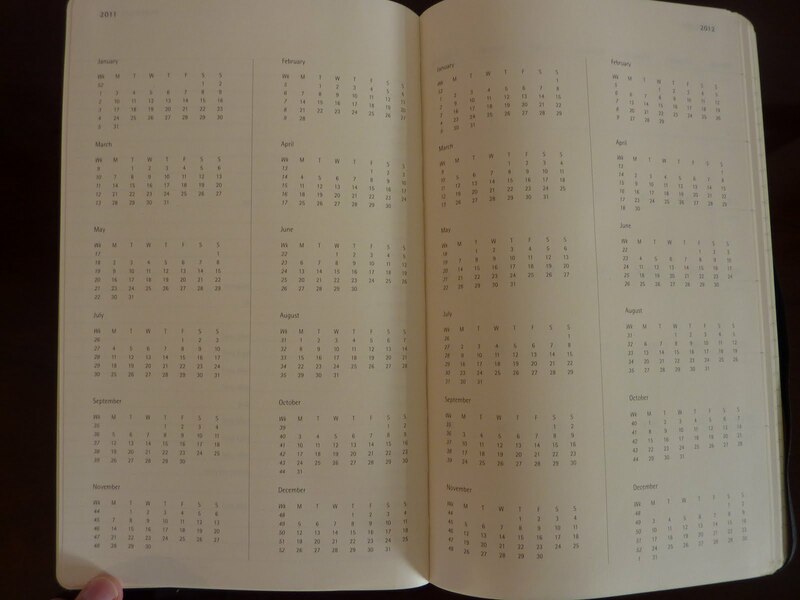 In addition to the weekly pages, these planners have monthly calendars with the months as columns. 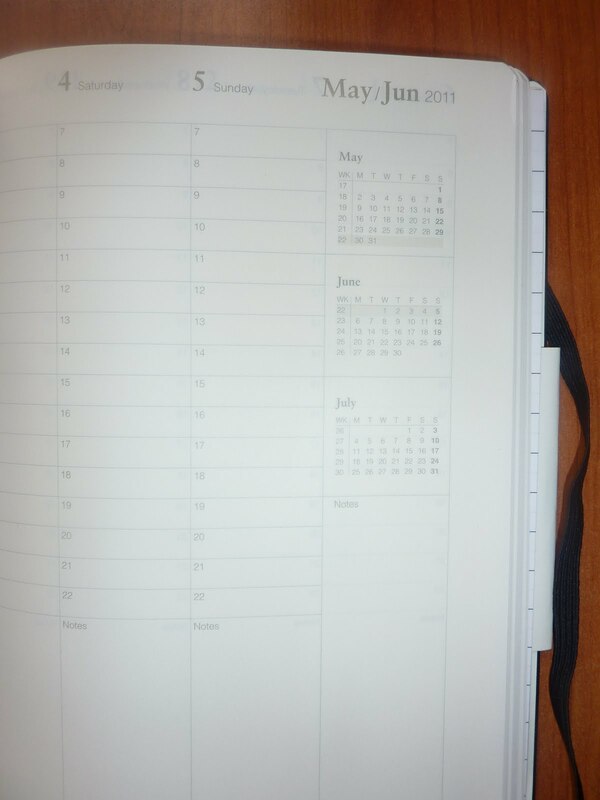 The planners both have a hard black cover, elastic strap, ribbon placemarker and back pocket. 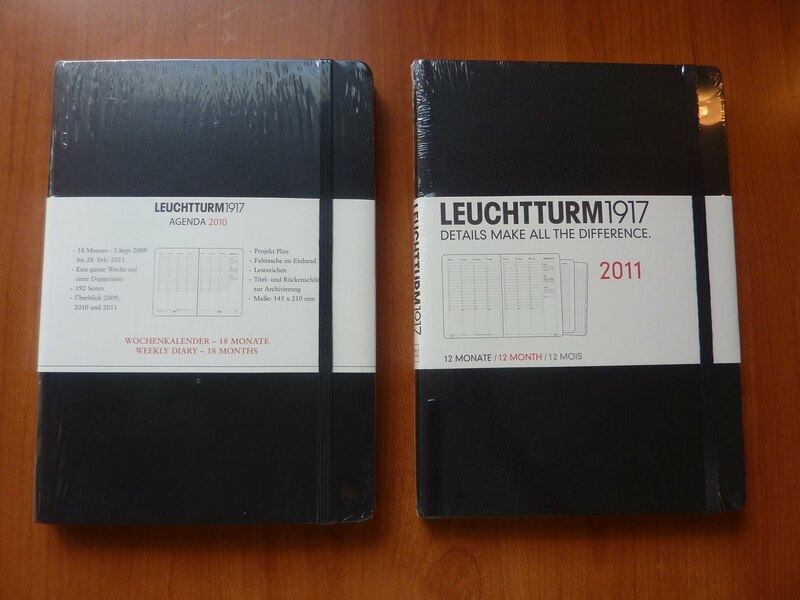 At this time, I don't know where you can buy the medium size 2011 Leuchtturm planners. Cynthia at Journaling Arts told me she may consider carrying these planners. If you are interested, you can contact her to ask if she will be selling these planners. Hi everybody, I'll be offline for a few days while traveling (to Croatia! Woo hoo!!). So if I don't reply to emails or comments, don't worry, I'm not dissing you. I'll be more than happy to reply when I get back! In the meantime, I have auto-scheduled a post for Monday that you DON'T want to miss! 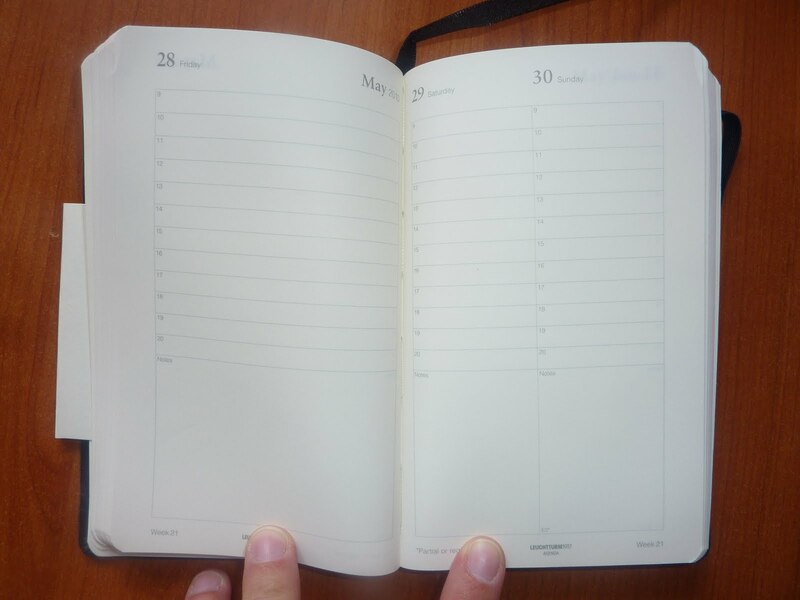 You know how I've said many times that it sure would be great to have a portable-size weekly planner with all seven days as full-size columns? I FOUND one!! A great one, actually. See my review this Monday the 14th! Here's an action shot of me and my Rickshaw bag in Apollonia! Apollonia is an ancient Corinthian, and later Roman, city in Albania that's a couple hours' drive from where I live. My family and I had a great afternoon among the ancient ruins! Some details: this is a Small Zero messenger bag from Rickshaw Bagworks (who also make the awesome Moleskine folios, and now custom iPad sleeves too!). It's called a Zero bag because there is zero waste in the production. Even the little scraps from cutting the material are used in the production of the bag. I used their Customizer to choose the exact colors of my bag. The purple color is called Iris (they also have an Amethyst purple that's slightly more bluish). The trim is Pink. I carried my lunch, guidebook, sunscreen, and enormous 2 liter bottle of water (which I removed for the photo for a better shot of the bag) up and down the hills all afternoon and hardly felt a thing. I told my husband, I can tell it's a well-designed bag if I can carry this much and it feels so easy! Thank you Rickshaw for an excellent bag! You can also see this photo on Rickshaw's Facebook page along with my and their comments about it! They mistook the location for Italy though, and I corrected them that it's Albania. Just across the water from Italy! I am woefully behind in my journal. I haven't written in it for months. A big reason for this, I now realize, is I've set up unrealistic expectations for myself in my journal-writing this year. I decided this year I will only write things in my journal that I want to remember. No emotional dumping, no negativity. But this has proven difficult. First of all, I've been stressed to the gills for most of this year. (As in, if we don't find a job in the next 2 1/2 months, we'll be unemployed and homeless. How's that for stressful?) Of course I don't want to remember stress like that. But it's a lot of work to edit out such a big aspect of my life. It's tied to everything else, so it's hard to suss out and write about only the memory-worthy events. 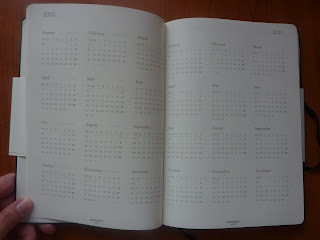 My second problem with my journal is that I use a dated day per page diary as my journal. 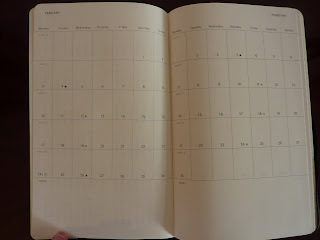 (A large Moleskine daily diary, to be exact, for the third year in a row.) 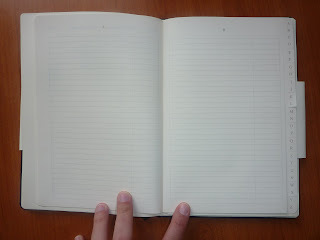 In past years I've found this motivational, because a blank page for each day encourages me to write SOMETHING. But with so many self-imposed constraints this year, I've tended to write nothing at all. And so, my journal sits closed on my bedside table. I thought maybe it would help to have my book sitting open somewhere on a table, and I could write into it throughout the day instead of waiting for time at the end of the day (which never happens. By the time the kids go to bed I'm too tired and drained to write anything meaningful, let alone memorable.) Writing short snippets throughout the day would probably give a better picture of my life anyway. Kind of like Tweets, in my journal. In fact, just yesterday I saw this awesome article via Moleskiners about how 18th and 19th century diaries were a lot like Tweets today. And today, Moleskiners points out another article about journals, fearing they may soon become extinct in this age of electronic technology. Journal-writers, how do you journal? Do you write something every day? Do you wait until you have a large block of time and write a bunch of pages all at once? I guess when and how you write is at least partially determined by what you write about. 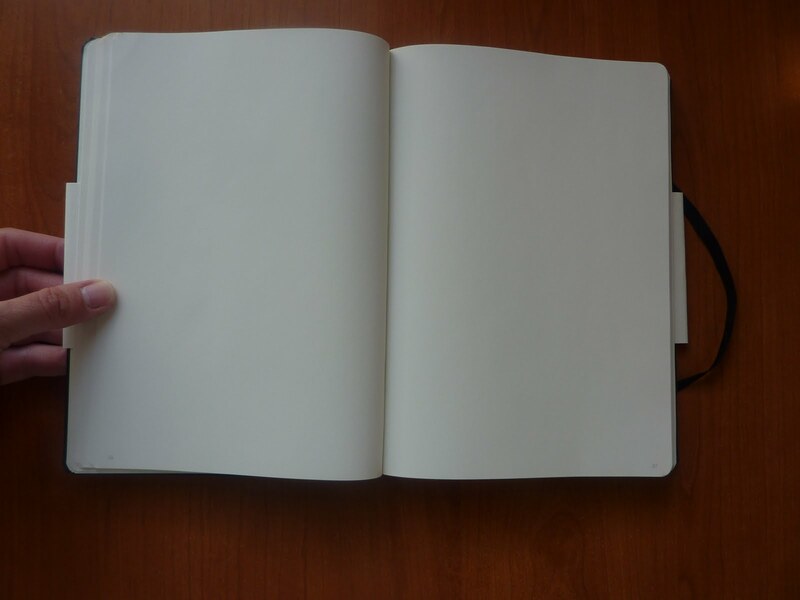 Is your journal your emotional dumping ground? (Journals are great for that.) Like me, do you try to write about things you want to remember? Do you try to create an accurate record of your life? Or, do you just write whatever you feel like? 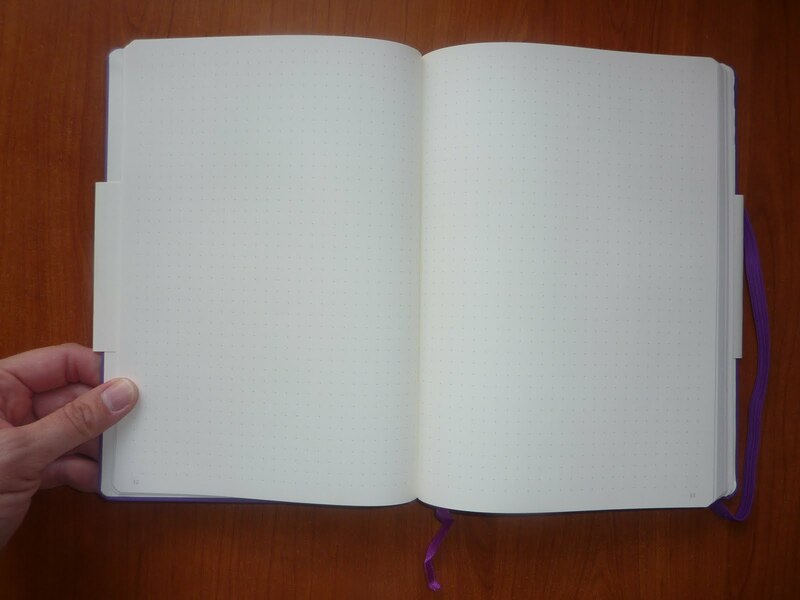 And while we're at it, what's your favorite book to write in for your journal?